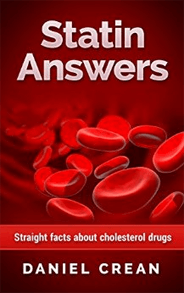 Rosuvastatin is the third-most used statin the US and is sold worldwide. Sometimes called a third-generation statin, rosuvastatin does not break down as rapidly inside the body compared to other statins. A study published in the Journal of the American Medical Association showed that rosuvastatin halts early atherosclerosis. This is exciting because people often get atherosclerosis but the symptoms don't show up for a long time. Middle-aged people with low Framingham risk scores (FRS) present a conundrum for doctors because nobody really knows if widely used statin therapy is beneficial. This study showed middle-aged adults with an FRS of less than 10% and evidence of subclinical atherosclerosis could get a reduction in progression of the condition with rosuvastatin treatment. Rosuvastatin did not induce disease regression in the tests, but the reduction in progression was statistically significant. When it first was sold, rosuvastatin was promoted as safer than other statins. However, the picture has become more murky over time. Analysis of the FDA Adverse Event Reporting System (AERS) database found "Relative risk rates for rosuvastatin were consistently higher than other statins. Atorvastatin and simvastatin showed intermediate risks, while pravastatin and lovastatin appeared to have the lowest risk rates." Further, the risk for muscle-related side effects rises with increased dosages. In a fairly famous (as scientific articles go) paper, Rosuvastatin: An Independent Analysis of Risks and Benefits, the authors conclude the risk-benefit ratio of this medicine is comparable to those of other statins on the market. No greater risk was found for rosuvastatin compared to other statins. Previous studies have found rosuvastatin safe and well tolerated. These results were found through conventional radomized clinical trials. However, the longitudinal survey of actual users of rosuvastatin after it was approved found problems. This discrepancy can be attributed to the high doses of rosuvastatin used. (the specificity of rosuvastatin allows higher doses). 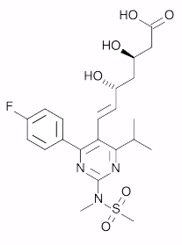 Rosuvastatin is sold by AstraZeneca under the brand name Crestor. The patent recetly expired and generic versions should be available. This is good news for patients and insurance companies as prices will fall. A recent clinical trial called "Saturn" found no real difference in effectiveness between rosuvastatin and atorvastatin. This was thought to be a major blow to AstraZeneca's business prospects because atorvastatin is available as an inexpensive generic formulation, and there is less of a credible reason for doctors to continue their patients on the more expensive Crestor. A generic version of this medicine is available in some European countries. A Dutch study on rosuvastatin for children in families with high cholesterol found that the drug could considerably reduce lipid levels in teenages, but not always to target levels. Although rosuvastatin has a decent market share, its sales are not expected to grow faster than the overall statin market in the foreseeable future. It is still under patent and the manufacturer is still charging a high price for it. Simvastatin and atorvastatin are available substantially cheaper and there is no significant difference in efficacy. AstraZeneca is trying to convince everyone otherwise. They sponsored the JUPITER study a few years ago which famously found their product wasn't any better than the alternatives More recently they completed the VOYAGER study and have said it shows heavy rosuvastatin use helps high risk patients more than atorvastatin does. Rosuvastatin is sold in pills of these strengths: 5, 10, 20, and 40 mg. Patients take one pill per day. The side effects are pretty much the same as those of other statins. The focus has shifted from looking at the cholesterol levels or LDL-C numbers to a bigger picture of overall risk as informed by several factors, Before 2013 the main guidance in the US came from the Adult Treatment Panel (ATP) III guidelines and those focused on getting LDL-C levels down. The guidelines put out by the American College of Cardiology and American Heart Association (ACC/AHA) in 2013 considers overall cardiovascular risk in whether a patient should get a statin.